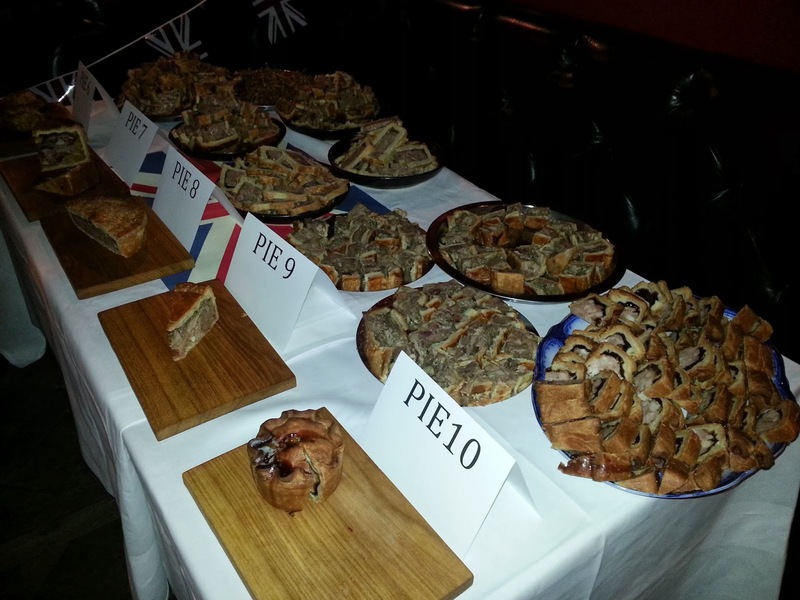 On Monday 3rd March, Pierate popped along to the inaugural Pork Pie Off, held at the Princess Victoria, West London, to help welcome in British Pie Week alongside high profile chefs and fellow pie fans. And what a feast of pork pie it turned out to be! Ten chefs from around the country entered their own take on the quintessentially British pork pie, and together debunked the myth of "It's just a pork pie. How inventive can you be?" (as one friend commented to me before the competition). The packed room was treated to pork pies of all different shapes, sizes, layers, textures, tastes and colours alongside some playfulness with fruity jelly and different pastries. We "woo"ed and "ah"ed as the show slices were exhibited, and then the real fun began as the pies were dished out one-by-one for scoring in the categories of "Filling", "Pastry" and "Overall impression". The judging panel included Tom Parker Bowles (Mail on Sunday), Christine Hayes (editor of Olive Magazine), and compère for the night Joe Warwick (Metro). But what was brilliant about the Pork Pie Off was that it wasn't just the panel who scored the pies - we all had a say! I found myself rating Pie 1 highly for all three categories. The filling was delicious, carrying just the right amount of spice and providing an ingenious take on the classic pork pie. The next 9 pies were also brilliant, but just not quite as brilliant as Pie 1. I rated that pie as my favourite of the night - and it soon emerged that I wasn't alone. Pie 1 was revealed to be the invention of Tom Langdon, the recently appointed head chef of Bermondsey gastropub The Garrison. Despite the stiff competition, Tom's pork shoulder, smoked streaky bacon and pork belly pie, dubbed the 'Pugly Pie', won the hearts of both the judging panel and the audience. Tom could therefore hold aloft both the judges prize and the people's prize. We hear that the double award-winning pie will be on sale at the The Garrison for the next two weeks, and Selfridges will also reportedly be looking into stocking the pie in the future. Overall, it was a fun night and I look forward to attending next year! Congratulations to Tom Langdon for his masterful pie. The Princess Victoria Pork Pie Off was not only a celebration of great British Pork Pies but also a great charity event too. The event looked to raise money for and awareness of “Action Against Hunger”, a charity that seeks to campaign for and provide sustainable support to malnourished children in about 45 countries worldwide. Overall, the event raised a total for £500 for the charity. Having been started in the 1970s, it is now the number 1 charity of choice amongst the food and restaurant sector, being supported at numerous food-related events across the country. Many restaurants, food festivals, top chefs and food critics support and promote the charity, particularly during their “Love Food, Give Food” campaign each year. While this is their first ever pie competition, we sure hope it won’t be their last! 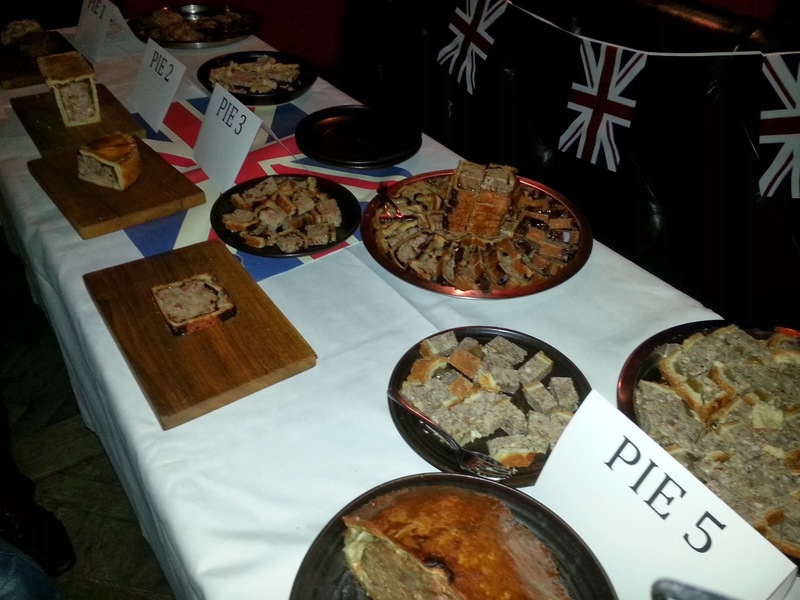 Their vast experience of supporting food competitions was on show at the Princess Victoria Pork Pie Off and we hope this is only the start of their relationship with the pie sector! We will certainly be in full support of any future pie-plans!